We all know that feeling don’t we… the sun is out temperatures are rising and yet any shorter length skirts or dresses just don’t look right – largely due to the pasty white leg syndrome. This is exactly where the fallback to chinos comes in. Chinos are the perfect item for Spring. Light enough not to feel sticky or hot and at the same time great for hiding winter white skin. If I told you how old these chinos are I’m sure you wouldn’t believe me… They are my personal absolute goto for this time of year! Keep reading to find out more about why chinos and how to style them! The best way to style chinos is to keep it simple. They are the one item that really do look best when you don’t over style them. OK – so this is really simple! However see how wearing a simple t-shirt and pretty mules already makes the outfit complete! Weather permitting you really don’t need anything else. Of course doing a bit of “matchy matchy” always polishes off an outfit. 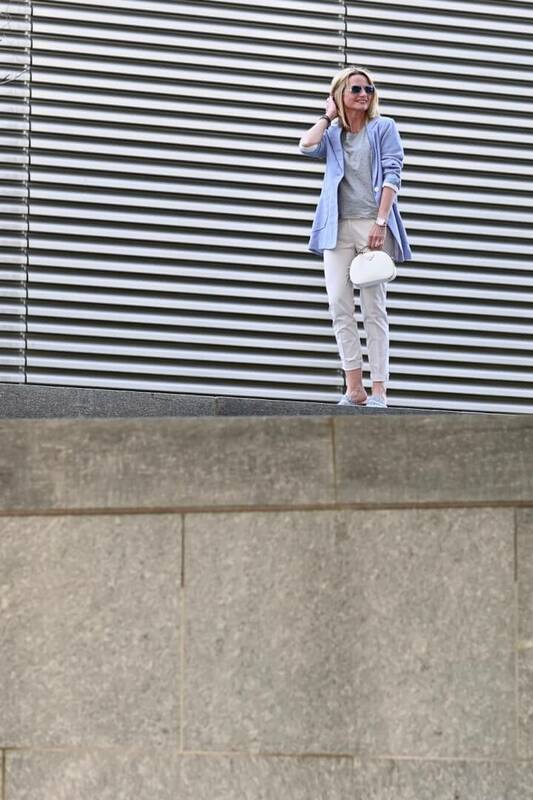 Usually in Spring some sort of trench or jacket is needed so why not make it match to either your shoes, or t-shirt. The length of your t-shirt – make sure it’s not too long. Longer t-shirts tend to look better worn with skinny trousers or jeans. 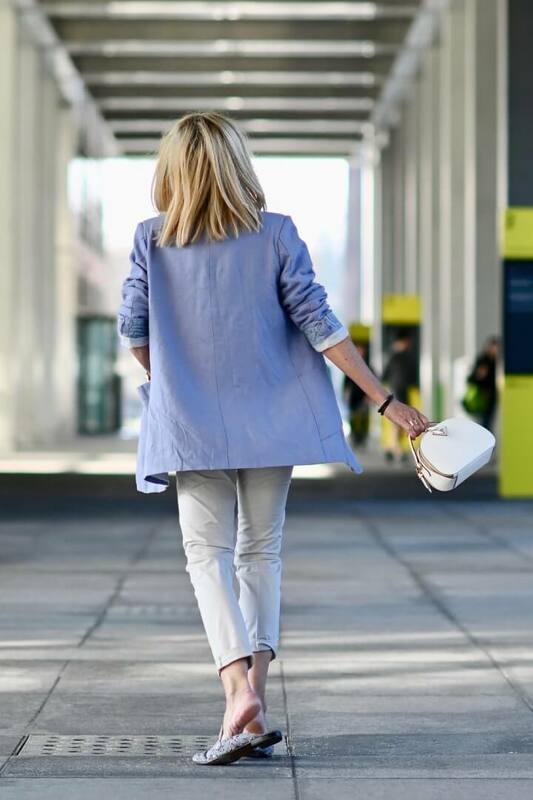 Jacket length – in particular for Spring 2019 the longer or even oversized jacket is definitely trending. Try one that’s even a little longer than in the photo. Unless you don’t really have hips, shorter jackets can look unfortunate. Colour – Going for a light neutral colour for your chinos will make them wardrobe staples for years to come. On that note, I’ll let you skip on into your day – smile! Stay tuned for Travel and Lifestyle News! Wishing you lots of fun preparing for Spring! Thanks dear Lise, so glad you enjoyed the post. Simple but yet so stylish! I love the blazer with them. I actually do not have any chinos in my closet but I will be on the lookout. And your tips will come in handy especially the one about the length of the tshirt! Amazing post! Would also love to see a post on wide leg pants!